Brrrr.... isn't it cold? The temperatures seem to have dropped dramatically in the last week and the change in seasons is definitely upon us. I really hate winter. I wouldn't mind if it lasted approximately 2 weeks so I could enjoy my Autumn Winter wardrobe of cozy knits but anything longer just makes me want to hibernate. What I do like however, is Molton Brown. 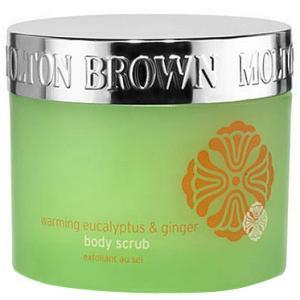 As regular readers have probably guessed by now, I'm also a fan of body scrubs so combine all of the above and you get today's review: Molton Brown's Warming Eucalyptus & Ginger Body Scrub. As tends to be the case with Molton Brown, the packaging is sleek and desirable. I like the bold colour and the weightiness adds a sense of luxury. Having said this, it is in a tub. I know I bang on about this but I really don't like scrubs to be presented in a tub format. The formula of this scrub would lend itself particularly well to a tube packaging- there's a lot of liquid in the tub and you have to stir the scrub to mix it before applying- so I simply can't understand why they haven't opted for this presentation. I wouldn't mind this quite so much if a spatula had been provided but it hasn't so it's just messy and unhygenic. However, one of the positives of the tub format is that when you unscrew the lid, you're hit with an incredible eucalyptus scent and this continues to be the case as you use the product. In fact, I can see myself reaching for this when suffering from a winter cold. As it contains ginger, it also boosts the circulation and I feel that this would be a good detox treatment come January. In terms of the scrub benefits, my skin was left smooth and feeling nourished although I still needed to apply lotion as I didn't find the oils sufficiently moisturising. I'll still hate winter but this product will definitely make it more bearable. As a fab pick-me-up, this is my winter must-have. It's easy to see why this is a bestseller. At £28.50 for 300g, it's pricey but worth every penny. Everyone should go out and buy a tub.